I received this little fellow from a friend of mine that was relocating to the West coast and could not take this poor little piggy with him. From the beginning I wasn’t sure how I felt about the little guy. He was grey, and even though he had cute little pig features, they were hard to see. From a distance he looked like a grey blob in the garden. I decided rather then send him to piggy heaven aka “the landfill”, I would try out some outdoor Mod Podge I had purchased a few weeks ago. 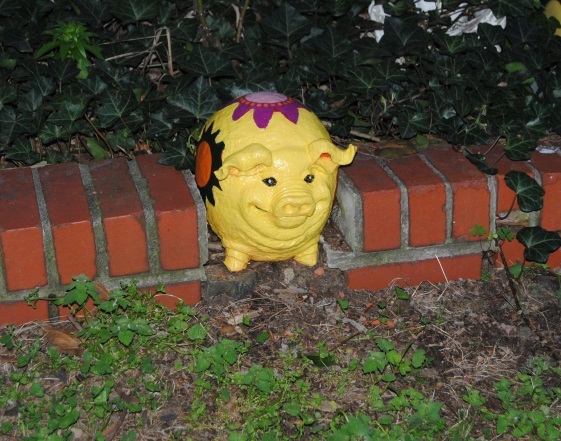 I would give the pig a final shot at garden glory. I was pleased with the end result, but It wasn’t easy! The first step was giving little piggy a good scrubbing and clean behind his ears. I placed him in the sink and started the hot water. I didn’t notice the small hole in the bottom of the pig. I started cleaning him and suddenly ants started pouring out of it! So lesson learned if something has been sitting out in the elements for a while, it’s not always the greatest idea to bring it into your home. So far I am thinking to myself this is not going well! At this point I am totally creeped out by all the bugs! Once the ants were eliminated, I cut out the flowers from the fabric and used the Mod Podge to glue the fabric to the pig. This made painting with the primer more difficult, but I really wanted the fabric to stick to the pig and it may not as well if glued directly to the primer paint. I then primed and let dry, cutting in around the flowers carefully. Then I made my 2nd mistake. I thought he would look good as a red pig. I painted him and I hated it! He looked darker than I expected and I was trying to bring out his features. So, I found an old can of yellow latex paint in the basement and I painted him yellow, but alas red is hard to cover. I should have primed it again before re-painting. I had to use 3 coats just to cover the red and even then some of the red was bleeding through, but it looked acceptable and I liked the dept the red gave it. 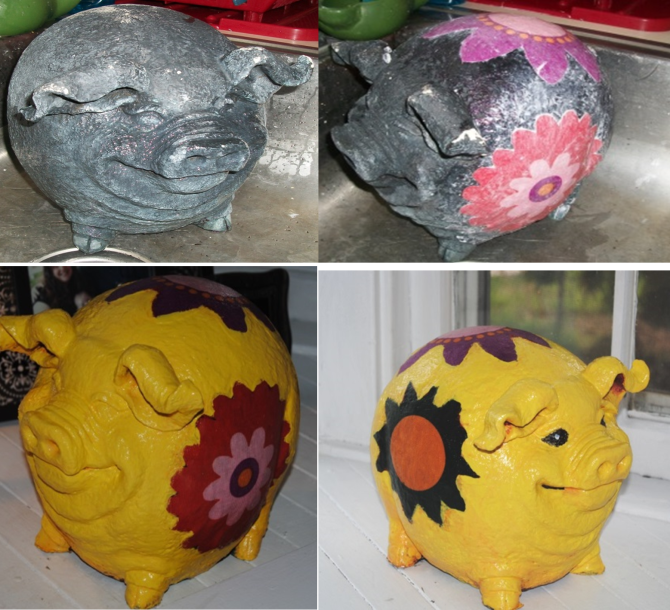 Once the paint dried I slathered on the Outdoor Mod Podge to seal the piggy. It is the first time I am using this formula, so I am interested to see how well he will hold up in the elements. I used a black marker to fill in his eyes, and added a slight outline to his mouth. After 72 hours in the house I was ready to release a bit of whimsy into our garden. It was a tough and challenging project, but I am pleased with how much color he adds to a not so colorful spot in our garden. He even fills in the space from a broken brick! I think I know how I feel about him now. I think I’m in love!